You can never prepare for a surprise animal attack. When a dog bites, you are suddenly thrust into a world of pain, medical bills, and uncertainty. Frequently, a dog bite occurs from an animal owned by someone you already know. If that's the case, it will be easy to identify the dog and owner. If the dog was a stranger to you, then you will want to get the name and phone number for the owner, as well as information regarding the dog's breed, rabies shots, and any other pertinent information. When a dog bites you, one of your first steps should be to file a police report to document the injury. This official record will help you when it comes time to pursuing compensation for your injuries. A police report filed weeks after the incident is still better than one never made. Local ordinances may also require you to contact the nearest animal control facility or public health department. Delaying treatment of a serious injury will only make it worse. Get the treatment you need immediately and worry about paying the bills later. Be sure to take photographs of the injury, too, and keep track of all your medical bills so that you will have the evidence you need to pursue a Missouri personal injury claim when you are ready. When you've been injured in a Missouri dog attack, you deserve compensation for your physical injury as well as your pain and suffering. You may try to pursue a personal injury claim on your own, but for best results you should consult with an attorney who can help you get the full amount of compensation you deserve. For help in recouping damages, talk to an experienced Missouri dog bite attorney today. 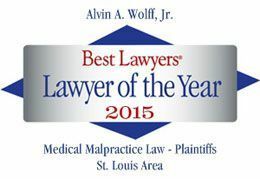 Call Alvin Wolff at 877-241-1020 to set up an appointment or request your FREE copy of The Guide on How to Pick a Lawyer.